Good morning! 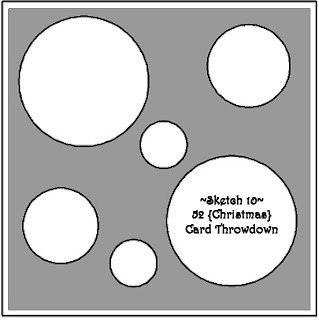 This week's 52 Christmas Throwdown blog challenge is a sketch Challenge. See below for a picture of the sketch and be sure to visit the 52CCT blog (link posted above) for some special news this month. I decided to make the bigger circles into ornaments and my images were stamped, colored, and then cut out and placed onto the punched out circles. My blue background was embossed using the perfect polka dots embossing folder and all my circles were placed onto my card using dimensionals. To help make the punched out circles look like ornaments I used my jewelry tag punch and I placed the punch out at the top of the circle and I tied on a nice bow using twine. I sponged all around the edges of my circles using bashful blue ink and then I lightly went all around the circle edges using my 2 way glue pen and then I dipped the circle edges in glitter- it looks so neat in person! And here is a photo of the sketch for this week's challenge. Thanks so much for taking the time to stop by! If you have a moment be sure to visit the other DT member's blogs and see what they've created using this sketch! Have a great day! Don't forget to check out my new challenge blog found here, the first challenge begins on Oct 22nd. Wow. That looks like a challenging sketch but you did a great jog with it. I like how you cut out all the images and then adhered them to the circles. Great way to interpret that sketch, it is a tuff one. The images are so cute! Hi Patty - what a great idea for this sketch! I love each of the darling images within the Christmas ormanents and the creative way you incorporated the sentiment. Way cute!! It's a cool and rather tricky sketch, and I love what you've done with it! You've really covered every aspect of Christmas, with angels, reindeer, Santa and elves! A cute and clean layout! Patty, great and cute card for that sketch!!!. The images are so adorable!!! How cute is this!?!?! I love those ornaments... great way to use the sketch! That's a pretty cool sketch Patty & you did great with it! Your card is really cute & I love the added sparkle! This card is sooo cute.